I have been hiking most of my life and backpacking since 2006. I have hiked mostly on the east coast, doing weekend trips in the Appalachian Mountains. Since moving to Arizona, my hikes have ranged from short desert hikes to overnight backpacking trips in the mountains. Recently I have taken up canyoneering and off-trail hiking/backpacking to spice things up. I currently use a solo non-free standing tent, canister stove, purification tabs, and lightweight trail runners, conditions permitting, to cut down on weight. My hikes are solo and range from an overnight trip to 4-5 nights on the trail. These fully welded dry bags are made with 210D nylon fabric with TPU lamination on the outer face for durability, water shedding, and abrasion resistance. The clean profile and oval base resists rolling and allows for easy packing. The high strength fabric is UV resistant and won�t crack in extreme cold. 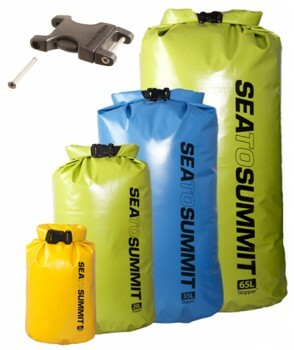 The bag seems very heavy duty, yet light weight compared to other dry bags I have looked at in the past. The bag came with a sticker on the top detailing how to properly close the dry bag before using it. The sticker is removed before using it, but the roll top has the directions printed on as a quick reminder - " to seal roll at least 3 times then clip buckle." One of the neat features for the product is the ability to replace the buckle should it break. 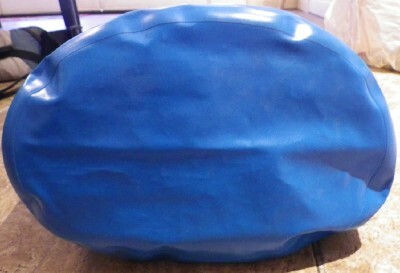 This may extend the life of the bag as the bag cannot be sealed without the buckle. Also once buckled, the buckled part makes for a nice handle for the bag. 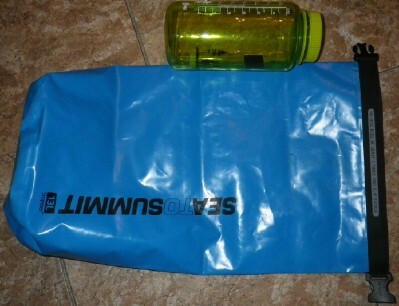 I took this dry bag with me on a 3 day 45 mile ( 72 km) backpacking trip to the Grand Canyon. I used it for my food - both to keep it dry should it rain (which it did not) and to protect the rest of my gear should I have a food packaging malfunction (which I did not). The first thing that I noticed was the oval shape made the packed bag into more of a box-shape instead of a tubular shape like my round bottomed dry does. Once packed with food for three days, the dry bag fit nicely in the top of my backpack - sitting across the top parallel to the bottom on the backpack. During the trip when we would stop for food breaks, I did notice that the bag did not roll when laid flat, just as advertised! The bag did not pick up any noticeable odors from the food, though my food was also packed in zip-lock bags. Since I did not have a chance to field test it in wet conditions, I submerged the bag in a sink full of water to test the seal. I found that the seal held when the bag was held under water for a minute. When opened the bag after submerging it, I did notice a few drops of water at the mouth of the bag, but not evidence that the water had passed the seal. So far the bag as worked well. I haven't used it in wet conditions, but I am sure that I will have it with me in water canyons soon! My Long Term Report will be out in about 4 months time, so check back to see how this dry bag holds up! 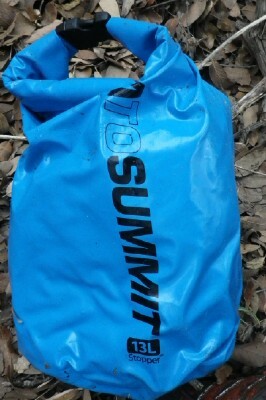 I would like to thank Sea to Summit and BackpackGearTest.org for the opportunity to test this dry bag. Trail Conditions: About half of the trail was a maintained trail and half was off trail in a canyon bottom. The off trail portion required wading, rock-hopping and scrambling, and bushwhacking. Weather: Everything - sunny, cloudy, a sprinkling of rain, and finally a few snow-flakes on the way out. Trail Conditions: Maintained trail with loose rocks, off trail hiking down a canyon involving rappelling down flowing waterfalls. Trail conditions: old jeep track, with some loose rocks and rock hopping at the bottom of the canyon. Trail Conditions: odd trail canyoneering day trip that involved swimming though pools and rappel down flowing waterfalls as well as boulder hopping. The bag preformed wonderfully in the field. On backpacking trips I used it to store my food in the event that it rained or one of my food bags ruptured. I had plenty of room for 3 days worth of food for 2 people on my trip to Havasupai. We kept all our food in this bag suspended from a tree to attempt to keep crows, ravens, and rodents away. The first day this bag contained 3 cucumbers, 3 bell peppers, 4 apples, in addition to dried foods for breakfast and supper. I tied the bag up by the handle formed after snapping the buckles closed to seal the bag. I did not notice any strain on the seams of the bag and the buckles held the weight well. Since rain is a somewhat rare occurrence here in the desert southwest, I took this dry bag on two day-long canyoneering trips where I knew that the bag would get wet from either being under a waterfall or swimming though deep pools in the creek bed. On both trips, I placed a dry set of clothes along with snacks in the dry bag and closed it. On each trip the bag got wet and on the trip through Shake Tree, also became somewhat dirty (see photo). However, everything inside the bag remained dry. At no point was the bag submerged for more than 5 minutes on either of these hikes, though the bag was wet or inside a wet backpack for 3-5 hours. At the end of one trip, I did not immediately unpack my food and trash from the dry bag and the trash started to smell. Once I removed the trash, the smell still lingered, but after a thorough hand washing with dish soap and being left to air dry, the smell when away. 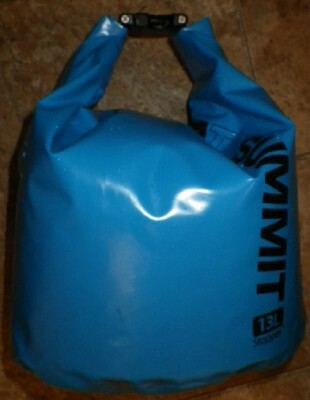 I found the dry sack easy to use and it has become my staple food bag for my backpacking trips. I find it handy to have all my food in the dry sack during the hike and then at camp it is easy to transfer the food to a storage container or to hang the dry sack from a tree. This dry sack has performed well in the field. It has kept my items dry in wet conditions and has not failed. I have not found noticeable signs of wear anywhere on the bag and the buckles work as well now as they did when I first got the bag in December, 2012. This dry sack has earned its place among my backpacking and canyoneering gear and I will continue to use it in the future. Thank you BackpackGearTest.org and Sea to Summit for the chance to test this product.